Frances seemed to flourish in adversity and was respected by all. In this day and age she would have ranked with the best of the feminists in matters of law and equity. The Maori's knew her as "Whani" and sought her help in the settlement of many disputes. Her decisions reflected fairness and a profound understanding of life and people of early colonial times in Northern Hawke's Bay. On many occasions life must have had more than its share of sorrow, solitude, loneliness, hazards, and near poverty. Perhaps we begin to glimpse her early philosophy. It's reflected on the headstone of her first born "Maud Ross - only child of David and Frances Ross —died April 21st 1878 aged 1 year and 4 months — 'If thou shouldst call me to resign what most I prize it ne'er was mine. I only yield to thee what is thine. Thy will be done'." After a long illness Jack died young. Then Frank was killed at Passechendaele. The minds of Frank and Frances bridged the present and infinite. Frank described in detail the San Francisco earthquake from the hearth at Willow Flat as it happened. Frances knew of the moment of death of Frank at Passechendaele. There were many unbidden fey happenings. The Kotemaori - Willow Flat road was put through, the Mohaka bridged solely through her determination. Frances strongly influenced the drafting of the Mortgagors Relief Act of 1931 and the Mortgagors Tenant Relief Act of 1932. These acts were to confer jurisdiction to grant relief of mortgagors in certain cases: to propose the exercise of powers of sale by mortgagees under existing mortgages in certain cases. My recollections of Frances are enduring and endearing. The excitements of packing and departure for summer holidays to Willow Flat were great indeed. A count of heads and a mother's question of "All serene?" saw the Service Car of the Hawke's Bay Motor Company get underway. Only then did enthusiasm dim. Dust, fumes of petrol and oil found their way through floor boards. Sudden bends, descents and laboured climbs soon took toll. Faces paled, stomachs revolted, mouths lost the happy smiles and fixed themselves in the uncertain mould of motion sickness. As we debussed at Kotemaori other passengers were delight to see the last of us. From there on life was filled with uncertainty. Sometimes Hori (George) Bee packed us into the Nash. Other times we simply walked the nine miles to Willow Flat. The older dragged the younger. Mother carried the younger in "blanket on back" style. The cavalcade stretched two miles and progressed in a croc of disorder. The big land marks were the Tin Shed at six miles and Bob's Basin at eight miles. Considering everything, nine miles in four hours wasn't too bad. The road could be best described as two seemingly endless ruts flanked by crumbling pumice banks riddled with the burrows of the giant pumice worms one side and a drop away on the other. Hills were covered in a riot of bracken, tutu, and manuka. The view from the summit of the last long hill took our breath away. A syncline stretched upward from the Mohaka in a sheet of vivid green. Beneath us nestled the homestead and outbuildings. Some distance behind stood a majestic limestone cliff topped with massive kanukas. In front a boulder strewn slope a mile or so stretched to the river. Our imagination could neither conceive the power in the river which created this land form nor the flourishing massive metropolis of crustaceans of aeons ago. The place captured the imagination. A mantle of mist occasionally shrouded the distant beech, matai and rimu bush of Maungantaniwha. It preserved that mystical and ethereal mood of the Ureweras, and of the primordial into which we seemed intruders. It was in the medium this spirit of soul of Frances Ross had free-way. As children we know of the depression of the 1930's. The effects it had on the hill country farming were never discussed. The Anglican minister visited and held a service whenever there was a fifth Sunday in the month. More than once his wife was trapped in the outhouse by a pet lamb grown up smart enough to take on anything that moved. He could work out the exits too. Bread was baked Monday, butter churned Wednesday. Occasional visitors came for meals. The owner of the Last Roundup arrived on horseback, complete in dinner suit with shirt collar and tie missing. His barrel chest was covered with a pink button-up woollen singlet - didn't seem at all strange. Two acres of lucerne kept the house cow and horses in hay, a vegetable garden and two orchards provided fruit fresh and for storing in firm covered cribs. Butter was stored in the tree shaded hole deep in the ground. Someone rode 12 miles for the mail every week or ten days. Pasture species were native grasses (Danthonia and rats-tails). Tall fescue was broadcast. A mistake by the seed merchant as I understand it. Fresh growth for the sheep sprouted once Bryant and May's wax vestas had done their job and rain had fallen. Farming life continued this way. The advent of giant discs, aerial top dressing, seeding, and better wool prices changed all that. Candles and Tilly lamps gave night light. Cards and books fill most evenings. Sometimes table-rappers took over. Entertainments were simple. With Gran Ross leading we headed for the river or the limestone creek. Deep eddies behind the rocks yielded the silver bellied eels, those same places served for swimming in high summer. Heads were always counted and instructions on the dog-paddle, part of her trade. I suppose we exhausted her. Every now and then she would send us off with lunch and a chuckle, to look for Mare's nests. Memory failed as time went on. Sometimes she would push her glasses beyond her forehead and bury them in her luxurious hair. The search would then be on in earnest. Her mortal remains lie in a grave beside Jack and Melville Ross at Willow Flat. A cairn overlooks the Mohaka. It is in my mind a memorial to the travellers and early settlers of Maungahararu, Enowra, Putorino, Waikare, Maungataniwha, Mohaka, Putere, and Molangaingi -names with lost meaning but sheer music to the ear. "The Rosses, like the Taits, the McMillans, and others, had been known by Marion and James in Mohaka. Frances Ross was a sister to George Bee. 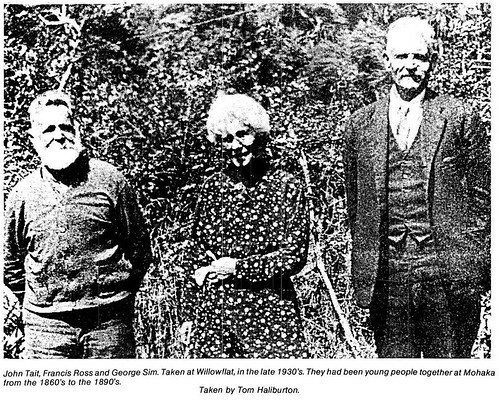 She and David Ross had been at Willow Flat,up the Mohaka river, since 1902. The bridle track from Willow Flat met the coach road near the Glenfarg homestead, so the Haliburtons sometimes saw them, coming and going. Frances was tall, slim, and very active in her seventies. Very hospitable, she was a keen orchardist, rider, and reader. The Haliburtons would ride out to Willow Flat, to gather fruit from the numerous fruit trees there. When the road finally reached the top of the hill at Willow Flat in the 1930's, it was being made by relief workers, and she would ride up to supply them with fruit, and books from her large library. She was very forthright. Once, when the men didn't supply the firewood, she put the mutton chops on the dining table with an axe, as a hint that firewood was needed before food was cooked. Another time her sister was having trouble with her husband, who was spending time with the women in the shearing gang. "Shoot him'', was the advice. One memorable episode is recounted by Jean. "There was a time when she was doing the washing, and as she rubbed on the washing board, a needle that had been left in one of the girl's blouses went straight into the palm and wrist of her hand. There was nothing to see except the thread that was on the needle. So Mrs Ross had to get on her horse, and ride alone the 12 miles out to the main coach road, hoping to get the coach going down to Mohaka, and Wairoa the next day. So I can remember mother bustling about to get a meal for her, and a hot cup of tea, and to make her comfortable for the night. Then by seven o'clock the next morning, she was up and away on that coach, to go 50 miles (80 km), to a doctor to have it taken out. I remember that she came back with her hand bandaged, and did the ride back to Willow Flat a few days later." Marion and Frances Ross had the isolation of backblock life in common. "Mrs Ross spent many evenings walking up and down the riverbank, wondering when the men would come home from felling bush away across the river. And mother did exactly the same, she sat with us little children each side of her, many an evening, listening for father coming home down a track." Both the Ross sons, John and Frank, were dead by 1918, but there were three daughters, Daisy, Elsie, and Phoebe. "I think the Ross girls might have been the most active of the local women, outside on the farms. They were great riders, and their country was very extensive and very rough. But it wasn't a general thing, only if there was illness or in emergencies, and the men were laid aside, then the women could tackle anything. But the isolation was so great that we didn't see what the other women were doing, we only used to hear bits here and there about something they had done." From "Glenfarg 1908 - 1937"
Maud - Born 1877, died 21.4.1878. Phoebe - Born at Ormond, Gisborne, raised at Mohaka and Willow Flat, and married H.H. Dewes of Napier. They settled at Taradale, then farmed at Petane until the Esk Flood of 1924. Ruined financially, moved to Napier. Set back again by the depression and earthquake of 1931. Lived in Napier for the remainder of her life. Generous, anxious for the well being of all, pleasure through entertaining the lonely and genteel, a rollicking sense of humour and a strong sense of fair play carried us all through times that never looked bleak but must have been. Issue: 5 daughters, 2 sons. Frank - Born Mohaka, lived and worked at Willow Flat until the outbreak of World War I. He left New Zealand with the XXI Reinforcements N.Z.E.F. and was killed at Passechendaele, France 1917. Jack - Died after a long illness aged 27. Both were extraordinary shots and worked solidly at the development of Willow Flat. Daisy - Born at Ormond. Moved to Mohaka, almost adopted by the Maori's who wanted to give her a moko. She spoke Maori fluently, married Harry Jago and settle at Otane. Much of their life was spent at Mangahararu and Willow Flat. In her later years life was spent at Frasertown. Daisy was exceptionally gifted at gardening and floral arrangement. Issue: 4. Elsie - Was born at Ormond in 1895 and schooled at Napier, lona, and Wanganui. After marriage, to John Borrie, lived and farmed at Eskdale, Mangahararu, Matawhero, Willow Flat and Omaranui. After John Borrie's death Elsie lived at Hineroa and Onga Onga until her death 19/8/1978. Imaginative and skilled in handcrafting bark from native trees and fibres, Elsie also had the gift of telling a tale with drama and laughter. Issue: 4 sons. Like so many in that age, the family fell victim of circumstances. What prospects there were in farming faded with the death of 2 sons and the great depression. They had telepathic powers and extrasensory perceptiveness, and all flourished in adversity. The children of the daughters were raised to be respectful, self-reliant and law abiding. Career opportunities began to open up for the grandchildren and increased dramatically for the great-grandchildren. Though these generations may not acknowledge it, the influences of Frances and her family have reached the present and contribute immeasurably to the success and stability of her descendants.